If you suffer from seasonal allergies like I do, being outdoors can cause excessive sneezing. You will probably end up with a red nose to show off too! Both myself and Ray suffer from these allergies in the summer, it can be such a pain! 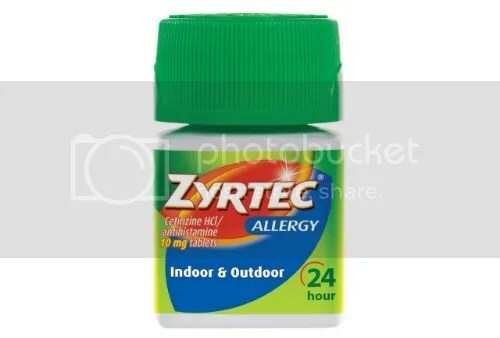 ZYRTEC® is the #1 allergist recommended brand among OTC oral antihistamines. It can provide quick relief of your worst allergy symptoms (like sneezing, runny nose and itchy watery eyes) caused by indoor and outdoor allergy triggers such as dust, mold and pet dander, tree pollen, weeds and grasses. ZYRTEC® can help you feel better and these ALLERGY FACE™ tips can help you look better too! You can combat ALLERGY FACE™ – beauty challenges like watery eyes, a red nose and a puffy face that often go hand-in-hand with allergy symptoms. Check out some beauty tips in the video below, as well as more statistics in the infographic shown. I was shocked to learn that 50% of women with allergies have had to miss out on something meaningful like a party or date, because of ALLERGY FACE™ and two-thirds (66%) of women with allergies have felt ugly or unattractive due to this. My best tips for combating ALLERGY FACE™ is not to aggravate your allergies with any new products or fragrances and use a gentle cleanser twice daily. I love to use cooling eye pads an other de-puffing products on my eyes as well. Every little bit helps! Be sure to check out Zyrtec on Facebook. What are your tips on dealing with Allergy Face? New Bath and Body Products at a Drugstore Near You! Find out more about some new drugstore products, head over and read one of my latest posts on the new site! Curious About Victoria’s Secret Fragrances? Come on over to the new site to find out more on the Summer fragrances from Victoria’s Secret and don’t forget to enter the $100 giveaway! New Giveaway on the New Site! You must re-subscribe on the new site to continue getting updates from My Highest Self! Want to follow My Highest Self by email? Snack Breaks & Fun Stuff! * Disclosure: Any brand marked with an asterisk will show that I received products from PR or the brand for review, but all reviews will ALWAYS reflect my honest opinions.